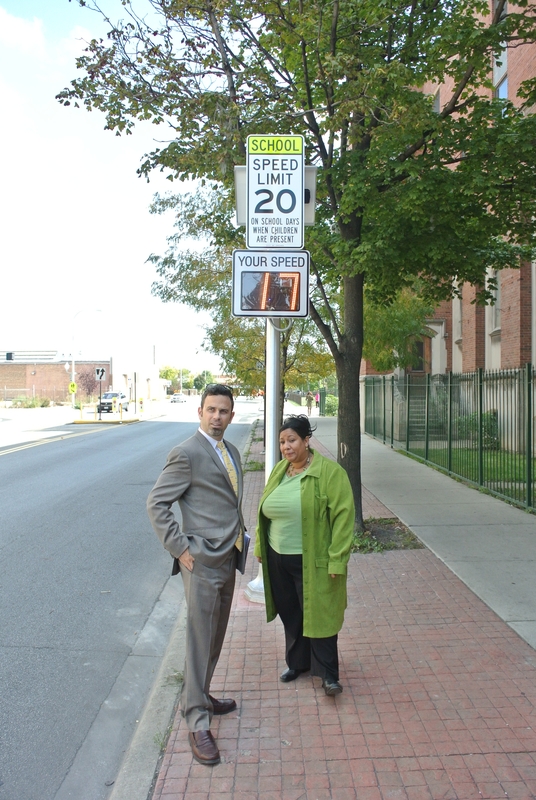 The city has 1,500 of these safety zones, designated areas within one-eighth mile of schools and parks. The Chicago Department of Transportation (CDOT) is planning to install additional infrastructure at dangerous intersections within these sectors to discourage speeding and make crossing easier. Currently there are about 3,000 pedestrian crashes a year in the city, with about 800 involving kids. And in this era of rising obesity rates, the goal is also to encourage more children to walk to school and to play at their local park. I zip down Kedzie Avenue through Humboldt Park, and Garfield Park, where I get a glimpse of Ruby’s, 3175 West Madison Street, a soul food restaurant where Martin Luther King Jr. often ate during his campaign for fair housing here. I zoom through Lawndale then shortcut across the lush Douglas Park green space to California Avenue, then continue south past the bodegas and taquerias of Brighton Park. Turning east on 63rd Street, I make it to the school just in time for the press conference at 63rd and Claremont, the northwest corner of the schoolyard. Here the east-west street is a busy four-lane with 18,000 cars passing by the intersection every day, according to CDOT. Between 2008 and 2010 there were thirty-two crashes involving children within the school’s safety zone, half of them involving cyclists or walkers. One of these sixteen kids was seriously injured. 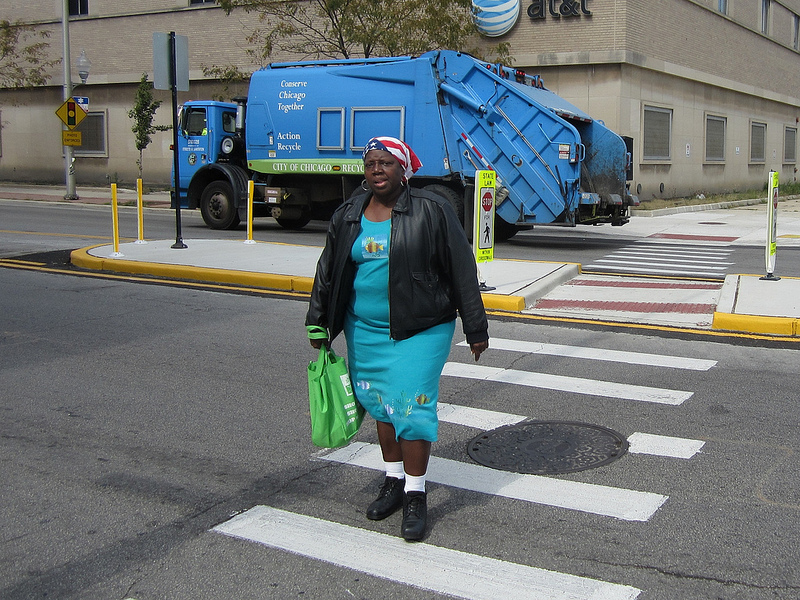 In response, the agency has installed a new pedestrian refuge island, high-visibility, zebra-stripe crosswalks, “Stop for Pedestrians Within Crosswalk” signs and a decal on a corner that reminds people on foot, “Be Alert. Be Safe.” They’ve also stenciled the words “Safety Zone” on the asphalt approaching the intersection and installed a speed feedback sign that tells drivers how fast they’re going. The total cost for these treatments was about $90,000. Of course the most controversial aspect of the city’s new safety initiatives is the upcoming installation of automated speed cameras, approved by City Council earlier this year. In 2003, Chicago implemented an automated red-light camera program, which has probably prevented many crashes but has also raised millions of dollars for the city via tickets. Many have criticized the speed cameras as a money grab by Rahm Emanuel to help patch the budget gap, but if we can save lives and reduce the deficit by forcing motorists to obey traffic laws, that strikes me as a win-win. Klein says next year the city will begin installing the cameras in school safety zones, in a maximum of twenty percent of the zones. The program will start with at least twenty-five cameras but could expand to 360 locations. Drivers will get a warning for their first violation, followed by tickets of up to $100 for subsequent offences. 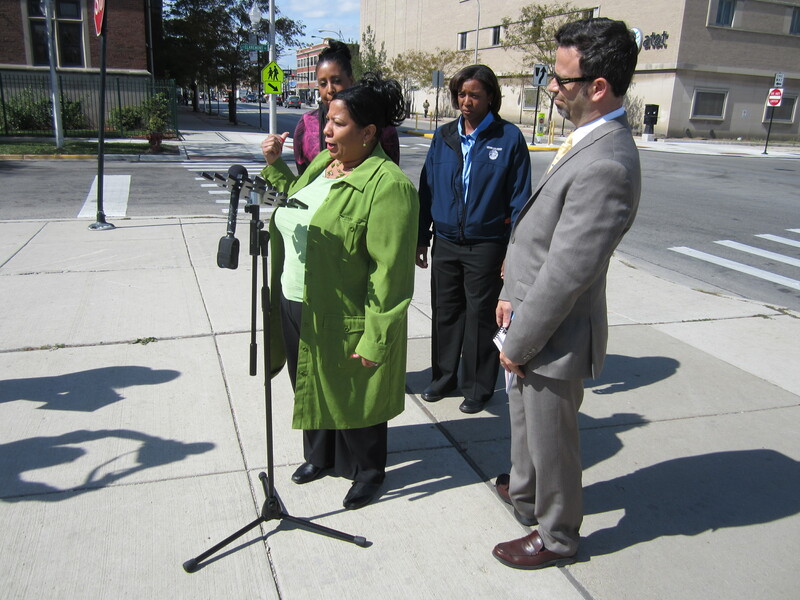 Afterward I ask the commissioner to demonstrate the new crosswalk. As he strides back and forth across the intersection in his gray suit and yellow power tie with pictures of automobiles on it, motorists obey the “Stop for Pedestrians” signs without being prompted. But when longtime Englewood resident Denise King, a retired hospital worker, approaches the intersection, she tells Klein she doesn’t trust drivers to stop for her. Chicago Meets Copenhagen Aldermen Harry Osterman and Ameya Pawar and CDOT deputy commissioner Scott Kubly will give a presentation about their fact-finding trip to the Danish capital to study bicycle facilities, followed by socializing at the Hopleaf tavern. Thursday, October 4, 7pm, Swedish American Museum, 5211 North Clark, (312)560-3966, tinyurl.com/cmcopenhagen; free. Franklin Boulevard protected bike lane celebration Join Alderman Walter Burnett on a leisurely bike ride around the 27th Ward on the protected bike lane, followed by bike games, free tune-ups, refreshments and a raffle for a new ride. Saturday, October 6, 11am-1pm, Westinghouse High, 3223 West Franklin Boulevard, (312)427-3325, activetrans.org; free. West Suburban Brewpub Ride Pedal fifty miles, including the Illinois Prairie Path and DuPage River Trail, visiting Lunar Brewing, Rock Bottom Brewery, Solemn Oath Brewery and ending at Two Brothers Roundhouse, where you can catch Metra home at the adjacent station. Saturday, October 6, 10am, Fellger Park, Belmont Street and Damen Avenue, tinyurl.com/wsbrewpub; free. Tour of Oak Park History buff Lee Diamond leads this excursion visiting many of the architectural landmarks, including several Frank Lloyd Wright buildings, in the western suburb native son Ernest Hemingway described as a place of “broad lawns and narrow minds.” Saturday, October 6, 11am-3pm, Scoville Park, Oak Park Avenue and Lake Street in Oak Park, (773)255-6347, chicagovelo.com; $9. Andersonville Pub Crawl This Chicago Architecture Foundation walking tour explores the neighborhood’s Scandinavian origins and Chicago’s brewing history, including stops at a “haunted” tavern and one of the city’s best beer bars. Sunday, October 7, 3:30pm-6pm, Edgewater Lounge, 5600 North Ashland, architecture.org; $15. Plugging in to Placemaking This roundtable discussion covers the role social media, mobile apps and other online tools can play in engaging the public in urban planning issues, including transportation. Tuesday, October 9, noon-1:30pm, Metropolitan Planning Council, 140 South Dearborn, Suite 1400, (312)922-5616, metroplanning.org; $30, includes lunch.